It’s that time again. Time for the #mondayfundayparty. Here is what I have been working on. Last week I posted my yummy fruit salsa recipe. You can see it here. Today we have 9 Patriotic Projects for you to see. Let’s start this party. Welcome back to Monday Funday Link Party! You right now are a part of one of the most rocking link parties in the blogosphere! Monday FUNday is a 6 blog link party where you some of the best projects from talented bloggers are all linked up in one place! Even better, if you are a blogger, YOU can link up YOUR projects! Thanks so much for joining our party! We are so happy to have you! Hello everyone and Happy Father’s Day to all our favorite Dad’s in our lives! 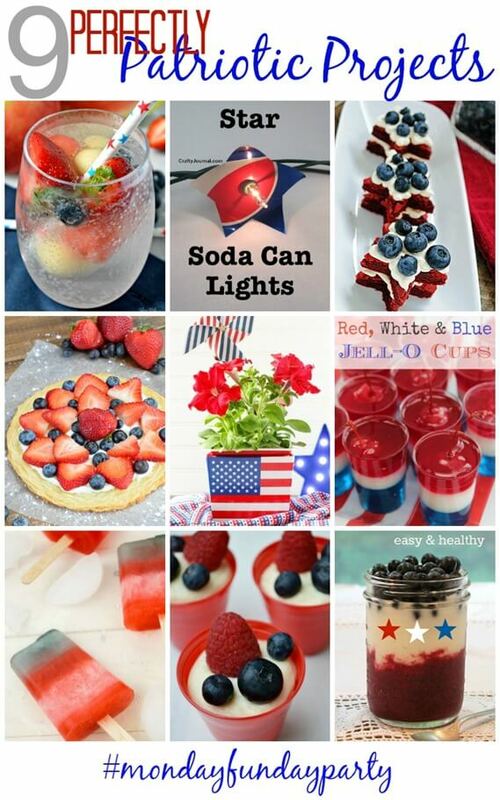 One of my favorite summer holidays is 4th of July and I have 9 Perfectly Patriotic Projects for you all today that were linked up to last week’s party! You all are what make our parties awesome so please feel free to invite friends this week! The more the merrier and you never know, it could be YOU featured next week!